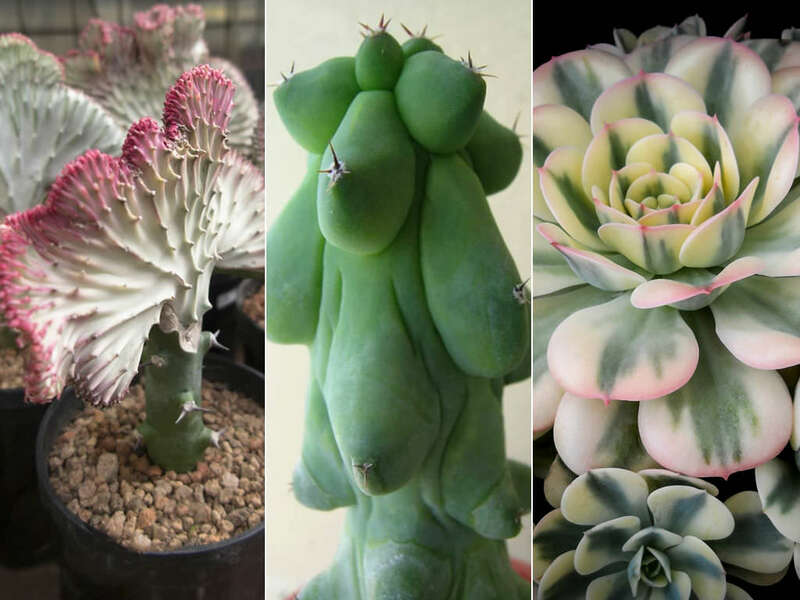 To understand what causes crested, monstrose and variegated succulents, a brief look at how plants grow is necessary. All plants grow in length by increasing the number of cells at the tips of shoots and roots. These regions of active cell division are called apical meristems and this growth is called primary growth. Some plants, most notably the monocots, have meristems at leaf bases that cause leaf elongation. In woody plants there are additional meristems called lateral meristems that produce secondary growth. The most important lateral meristem is the vascular cambium, which produces wood and bark. Monstrose and crested growth only involves primary growth. Cell divisions in the apical and intercalary meristems are highly regulated and finely tuned in each kind of plant, resulting in distinctive stem and leaf shapes. For example, very rapid apical growth with a suppression of branching results in long, slender stems whereas, slower growth results in “fatter” stems. Stems without apical dominance are highly branched. In general, cacti have apical dominance with slow apical growth and are “fat” (and the cells filled with water, making them succulent). So, in cacti faster growth results in columnar cacti and slower growth results in barrel cacti. Occasionally something called a growth mutation happens that “messes up” these regulated and coordinated cell divisions in the primary meristems. The causes of these mutations range from injury to bacterial or viral diseases. The 3 most common types of growth mutation are crests, monstrose growth and variegation. In crests the growth mutation changes the shape of the apical meristem. Instead of a single growth tip the area of active cell growth becomes a line, resulting in fan-like or crested growth. In monstrose growth, the local apical dominance is lost and every growth tip tries to grow as if it were the dominant point, resulting in a “knobby” or “lumpy, jumbled” growth. Variegation in succulents is almost always caused by normal genetic variation, at least initially. Once this mutation occurs, they are selected for and magnified in the cultivation process. Most variegates in the wild would probably be eliminated due to the tendency for the variegated tissues to be naturally “weaker” and more prone to insect attack, sun damage, lesser ability to photosynthesize in low light situations (and hence become weak and die) and infection from fungi and bacteria. But in captivity, under the right environments, or protected from evolutionary pressures, many of these variegated plants perform beautifully and make excellent landscape and potted plants. Usually variegation is due to the lack of chlorophyll in that section of the leaf forming a yellow or white band, streak or mottling of tissue. Sometimes variegation is due to the presence of pigments that mask the chlorophyll pigments producing even darker colors (purples, reds etc.). Variegation streaking down the middle of leaves is referred to as medio-variegation while variegation down the sides of the leaves (margins) is margin-variegation.